Next, we will look at what this means to the organizations that are primarily responsible for paying for these crucial, but very expensive drugs: insurance companies and self-insured employer groups (often assisted by PBMs). What can they look forward to? What tools and strategies are available to ensure that these medications are properly used? Are there limits to how much they should pay? 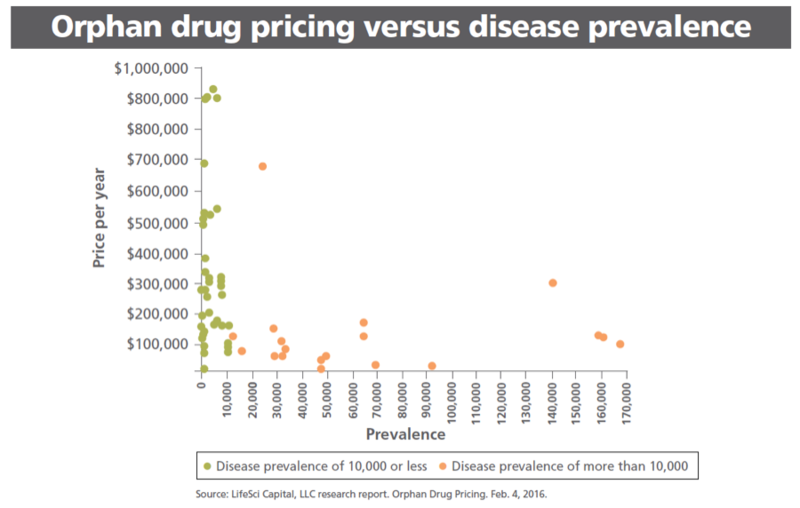 We should expect to see continued rapid expansion in the numbers and cost of orphan drugs. There are several reasons why. First, at the broadest level, they represent a larger turn by the pharmaceutical industry toward biologic drugs. This is an historic shift driven partly by advances in science, to be sure, but also by strategic considerations around how to maximize profits and protect market exclusivity.1 See our extended discussion on this here. Let’s think about that: some of the most expensive drugs in the world have the lowest development costs. This brings a moment of great clarity: The question isn’t so much why drug makers are increasingly turning to orphan drugs. It’s why on earth would they make anything else? Once a new orphan drug is developed, it must be approved by the FDA. After this happens, there is an essential intermediate step before it actually becomes eligible for reimbursement under the terms of a benefit plan. This is the process where pharmacy benefit managers and other payers have their Pharmacy and Therapeutics (P&T) committees review the new drugs. Of course, there is not always universal agreement on the cost-effectiveness of every new drug. For example, Xalkori® (crizotinib) is an anti-cancer drug that originally received orphan status from the FDA for the treatment of a rare type of advanced (metastatic) non-small cell lung cancer, and has just this year also received breakthrough status and an additional indication for another rare type of advanced lung cancer.7 Orphan and breakthrough status are usually indicators pointing to an innovative, effective new drug. 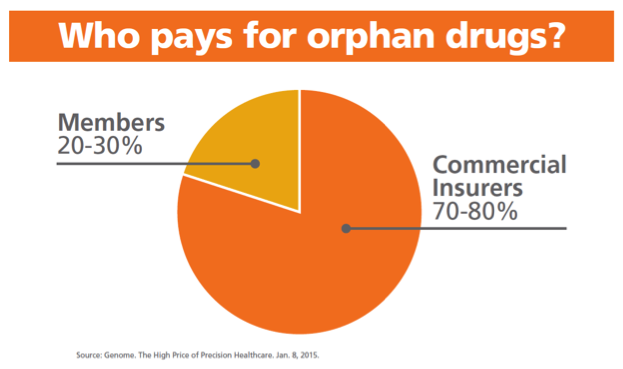 Humanitarian considerations aside, there are at least two sound economic reasons why most plans accept most orphan drugs for reimbursement. There are about 15,000 SBS patients in the U.S. Of these, between 3,000 and 5,000 SBS patients will benefit from Gattex.3 If most of these people received treatment, the aggregate annual cost would be around one billion dollars. Under these conditions the costs are going to mount. The question now turns to potential management strategies. But this number is changing fast. 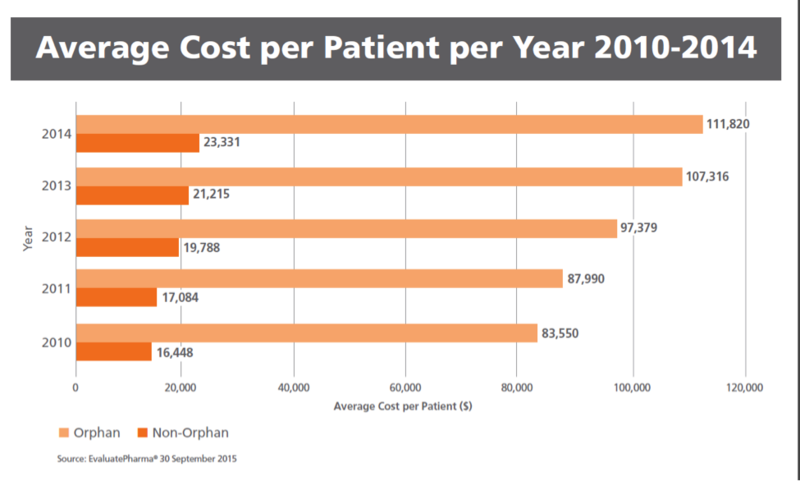 These kinds of prices and spending totals are sure to force payers to focus their attention on controlling orphan drug costs. The question is, how? We’ll look at a few of these here. Competition does present some mitigating effect on costs in the rare disease market. Already today, there are a few conditions such as Gaucher’s disease, where a number of alternative treatments are available. In the presence of highly competitive markets, drug makers are forced to offer rebates up to 50%.2 Looking further ahead, there are indications that competition will continue to grow as more drug makers seek to enter the market. 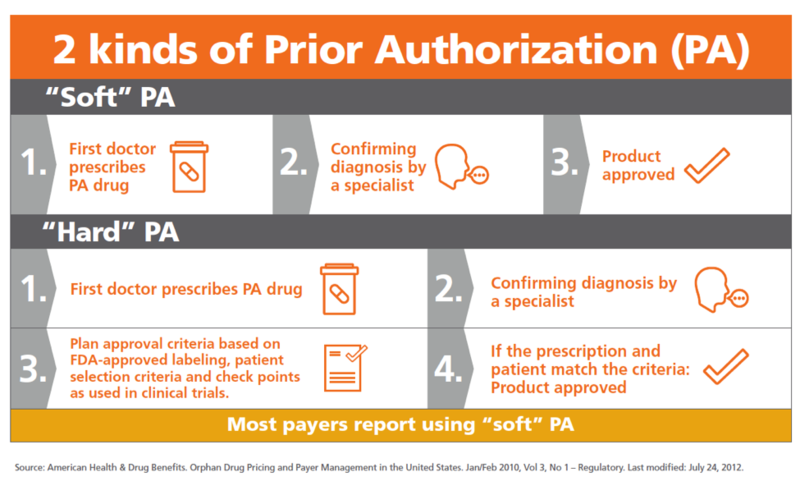 For Plan A, prior authorization means getting a confirming diagnosis by a specialist. This leads to the approval to use the product. Plan B’s also requires prior authorization in the form of a confirming diagnosis by a specialist. But Plan B’s approval criteria go on to account for FDA-approved labeling and patient selection criteria and end points as used in the clinical trials. Let’s say Plan B determined that the drug in questions was intended for a patient who did not match the patient selection criteria from the clinical trials. They would deny coverage – even with a prescribing specialist's recommendation. As costs continue to soar – not only for orphan drugs, but also for many specialty drugs, payers are increasingly making plan design changes that include higher out-of-pocket costs for patients. Inevitably, questions arise regarding how ordinary families can afford to cost share such expensive drugs. At 20% coinsurance, a drug that costs $200,000 per year would cost $40,000. The first consideration will be the specific plan design in question. Depending on the plan details, individual costs could vary widely. How much or how little remains the responsibility of the member will depend on details, such as whether there is an out-of-pocket maximum, how much that is, and whether prescription drugs are included under the maximum. Another consideration is exactly how a given drug is administered. When patients self-administer specialty drugs, or take them orally, the pharmacy benefit usually provides coverage. In contrast, when a health care provider administers specialty drug therapies, plans tend to cover the drugs as part of the medical benefit, which has a different approach to payment. In the case of the ApoE4 test for increased risk of Alzheimer's mentioned above, the answer is probably “no.” Most people with the gene don’t get Alzheimer’s, and there’s no treatment if they do. The opposite is true for women who have BRCA1 and BRCA2 mutations. These have been linked to a higher risk of breast and ovarian cancer, which definitely can be treated.3 In fact, for a specific type of breast cancer (HER2-positive), additional genetic tests can determine whether to use a highly targeted drug called Herceptin® (trastuzumab). In effect, only those with the right genetic profile can benefit from Herceptin, which is important to know because it is very expensive. Insurers are therefore motivated to cover some kinds of genetic tests, since they can directly impact the treatment being delivered to the member. And while it is true that many doctors remain skeptical of some tests, it seems likely that tests will continue – and continue to improve – as our understanding grows. We can imagine at least two very different futures regarding orphan drugs. One path would see us following more or less along the same trajectory we are on now: more orphan drugs, higher prices, more indications, more spending, further cost sharing and other benefit restrictions. This hardly seems ideal. Most people would probably agree that whatever measures are eventually adopted, we need to strike a careful balance. We should first want to ensure that the spirit of the original act is upheld, by continuing to provide critical economic incentives for truly rare diseases. At the same time, everyone has a vested interest in an orphan drug regime that is sustainable over the long term. This is the only way to ensure access and affordability for patients and payers. Modern Healthcare. Orphan drugs paying off for firms, despite pushback. May 31, 2014. Accessed at: http://www.modernhealthcare.com/article/20140531/MAGAZINE/305319960 on 06.17.2016. Pharmaceutical Commerce. 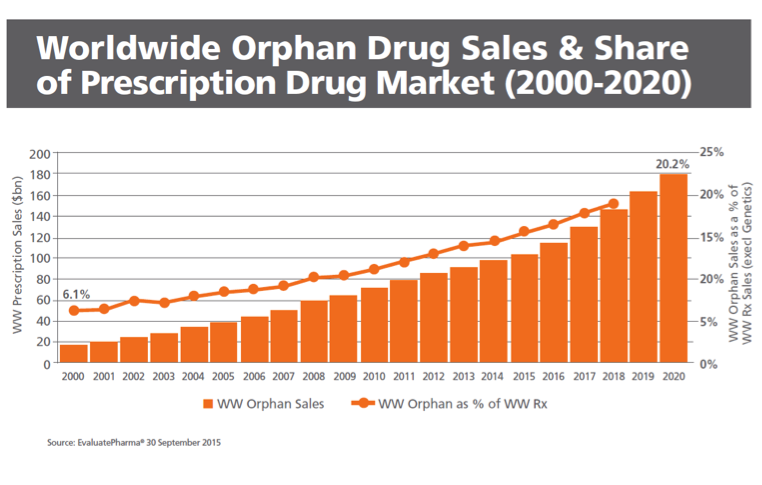 The business of orphan drugs is booming. Aug 26, 2015. 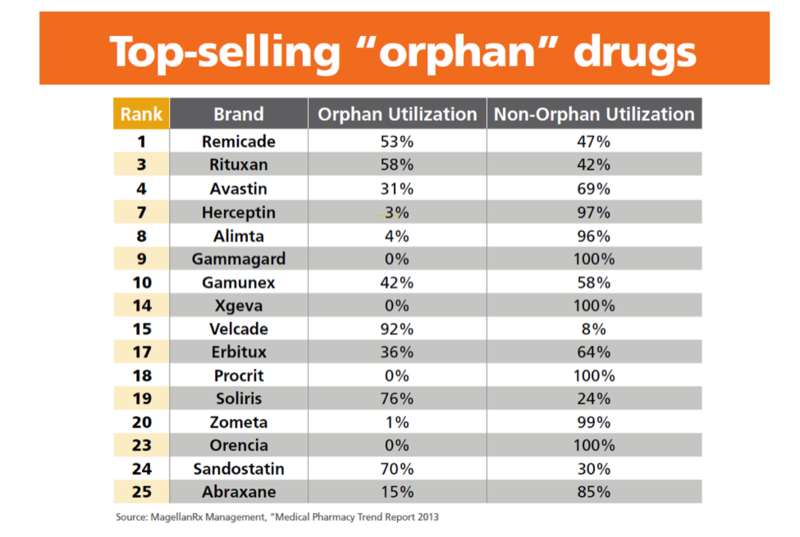 Accessed at: http://pharmaceuticalcommerce.com/brand-marketing-communications/the-business-of-orphan-drugs-is-booming/ on 06.17.2016. Genome. The High Price of Precision Healthcare. Jan. 8, 2015. Accessed at: http://genomemag.com/reimbursement/#.V1rcXU32aic on 06.10.2016. EvaluatePharma. Orphan Drug Report 2015. Oct. 2015. Accessed at: http://info.evaluategroup.com/rs/607-YGS-364/images/EPOD15.pdf on 06.10.2016. Genetic Engineering & Biotechnology News. The High Cost of Rare Disease Drugs. March 4, 2014. Accessed at: http://www.genengnews.com/insight-and-intelligence/the-high-cost-of-rare-disease-drugs/77900055/ on 06.16.2016. Specialty Pharmacy Times. Managing Care and Costs for Orphan Conditions. Feb. 09, 2015. Accessed at: http://www.specialtypharmacytimes.com/publications/specialty-pharmacy-times/2015/february-2015/managing-care-and-costs-for-orphan-conditions on 06.13.2016. FDA News Release. FDA expands use of Xalkori to treat rare form of advanced non-small cell lung cancer. March 11, 2016. Accessed at: http://www.fda.gov/NewsEvents/Newsroom/PressAnnouncements/ucm490329.htm on 06.13.2016. OptumRx internal analysis. Data from 2014-2016. American Health & Drug Benefits. Orphan Drug Pricing and Payer Management in the United States: Are We Approaching the Tipping Point? Jan/Feb 2010, Vol 3, No 1 – Regulatory. Last modified: July 24, 2012. Accessed at: http://www.ahdbonline.com/issues/2010/january-february-2010-vol-3-no-1/97-feature-97 on 06.20.2016. National Organization for Rare Disorders. Patient Assistance Programs. Accessed at: http://rarediseases.org/for-patients-and-families/help-access-medications/patient-assistance-programs/ on 06.17.2016. American College of Preventive Medicine. Genetic Testing Clinical Reference For Clinicians. Accessed at: http://www.acpm.org/?GeneticTestgClinRef on 06.20.2016. Personalized Medicine. Growth of Molecular Diagnostics and Genetic Testing in the USA, 2008-2011. 2013;10(8):785-792. Accessed at: http://www.medscape.com/viewarticle/813172_1 on 06.20.2016. Mayo Clinic Center for Individualized Medicine. 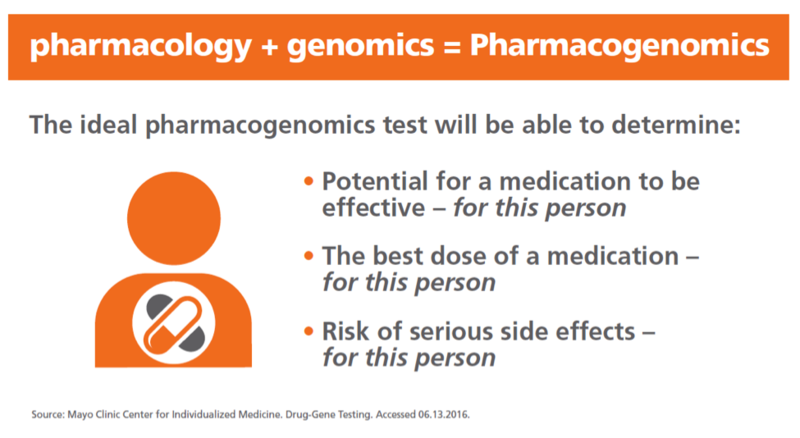 Drug-Gene Testing. Accessed at: http://mayoresearch.mayo.edu/center-for-individualized-medicine/drug-gene-testing.asp on 06.13.2016. Johns Hopkins Medicine Press Release. 'Orphan Drug' Loophole Needs Closing, Johns Hopkins Researchers Say. Nov. 19, 2015. Accessed at: http://www.hopkinsmedicine.org/news/media/releases/orphan_drug_loophole_needs_closing_johns_hopkins_researchers_say on 06.17.2016.